US AID says it is committed to increasing the amount of contracts going to Haitians. “We already are engaging with Haitian communities to make them aware of how they can partner with us,” said Janice Laurente, a spokeperson for US AID. Yet a new analysis from Haiti: Relief and Reconstruction Watch shows that since December 2010, not a single contract has been awarded to a Haitian firm, according to the Federal Procurement Data System (FPDS). As of April 14, 2011, 1490 contracts had been awarded, since the January 2010 earthquake, for a total of $194,458,912. Of those 1490 contracts, only 23 have gone to Haitian companies, totaling just $4,841,426, or roughly 2.5 percent of the total. 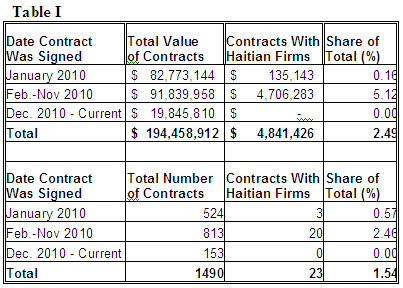 Table 1 shows the breakdown of contracts going to Haitian firms organized by the date the contract was signed. As can be seen, after originally being neglected, Haitian firms fared better from February 2010 through November 2010, receiving 5 percent of the value of all contracts. Since December 2010, however, not a single Haitian company has received a contract despite nearly $20 million being awarded in the last five months. The last contract awarded to a Haitian firm was actually signed on November 9, 2010, according to FPDS records. Although one possible explanation for the lack of participation by Haitian firms early on was the use of no-bid contracts, this does not account for the lack of Haitian participation. The share of no-bid contracts has actually increased in each time period, from 15.5 percent of all contracts in January 2010, to 16.4 percent from February - November, to an astounding 42.5 percent of all contracts in the previous five months. If no-bid contracts were used predominantly because of urgency, one would expect to see the share of no-bid contracts decreasing over time instead of increasing. While Haitian firms have largely been left on the sidelines, Beltway contractors (from DC, Maryland and Virginia) have received 39.4 percent of the nearly $200 million in contracts, as can be seen in Table II. Two of the largest Beltway contractors, DAI and Chemonics, we have written about numerous times before. Despite the statement from USAID atop this post, they have actually been one of the worst US government agencies in terms of contracting to local businesses. USAID has awarded contracts totaling $33.5 million yet not a single contract has been awarded to a Haitian company. In addition, an astounding 92 percent of contracts awarded by USAID have gone to Beltway contractors. Which Haitian Firms Are Getting Contracts? Even this, however, overstates the benefits that have gone to Haitian firms. The 23 contracts that have gone to Haitian firms have gone to just six different companies, many large corporations with ties to the international community. Table III shows the six Haitian companies that have received contracts, and what the values of those contracts are. Sanco Enterprises received nine contracts between February 2010 and October 2010 for “life services”, predominantly waste removal, water delivery and supplying porta-potties. Sanco, however, has not received a contract since October when the cholera epidemic began to spread throughout Haiti. A leading theory as to the cause of the cholera outbreak was improper waste removal at a Nepalese UN Peacekeeping base. The company that had the UN contract for waste removal at the base was Sanco Enterprises. He has the prime minister's ear. He hobnobs with people like Bill Clinton, George Soros and the chief executives of the world's largest corporations. He is one of Haiti's storied elite, a member of one of the six families that control the Haitian economy and have essentially called the shots here for generations. Distributeurs Nationaux, a fuel distribution company, is part of another one of the largest Haitian conglomerates, the GB group run by Gilbert Bigio. In 2009, Distributeurs Nationaux, with the help of an $18 million loan from the Inter-American Development Bank, acquired the assets and operations of Chevron Haiti. The GB group, together with Ashbritt (an American contractor we have written about previously) formed the Haiti Recovery Group (HRG). HRG was recently the subject of a lawsuit by the former USAID reconstruction coordinator Lewis Lucke. Lucke contends that he is owed $500,000 for helping HRG secure reconstruction contracts. Haiti's top reconstruction planning official owns part of the country's largest concrete company, which stands to reap major gains from the coming wave of international rebuilding aid. Patrick Delatour, Haiti's tourism minister, leads a commission that has been crafting plans to rebuild Port-au-Prince and other earthquake-devastated areas. He acknowledged he is 5% owner of GDG Concrete and Construction, which he started in 2000 with his cousin. The company, which calls itself Haiti's only supplier of ready-mixed concrete, helped construct the U.S. Embassy and several other major buildings in Port-au-Prince, it says on its website. Sol Haiti is another fuel distribution company, with operations throughout the Caribbean. Sol took over Shell’s assets in much of the Caribbean in 2005 and took over Exxon-Mobil’s assets when the former divested from Guyana, Suriname and Haiti in 2007.